Researchers at the University of Tokyo have discovered a new type of material which stores heat energy for a prolonged period, which they have termed a "heat storage ceramic." This new material can be used as heat storage material for solar heat energy generation systems or efficient use of industrial heat waste, enabling recycling of heat energy, since the material releases the stored heat energy on demand by application of weak pressure. Materials capable of storing heat include those such as bricks or concrete that slowly release the stored heat, and others such as water or ethylene glycol that take in heat when they transform from a solid to a liquid. However, none of these materials can store heat energy over a long period as they naturally release it slowly over time. A material that could store heat energy for a long time and release it at the exact timing desired would be a boon for the field of renewable energy. The heat storage ceramic discovered by the research group of Professor Ohkoshi at the University of Tokyo Graduate School of Science preserves heat energy for a prolonged period. This material, called stripe-type-lambda-trititanium-pentoxide, is composed of only titanium atoms and oxygen atoms, and can absorb and release a large amount of heat energy (230 kJ L－1). This heat energy stored is large at approximately 70% of the latent heat energy of water at its melting point. 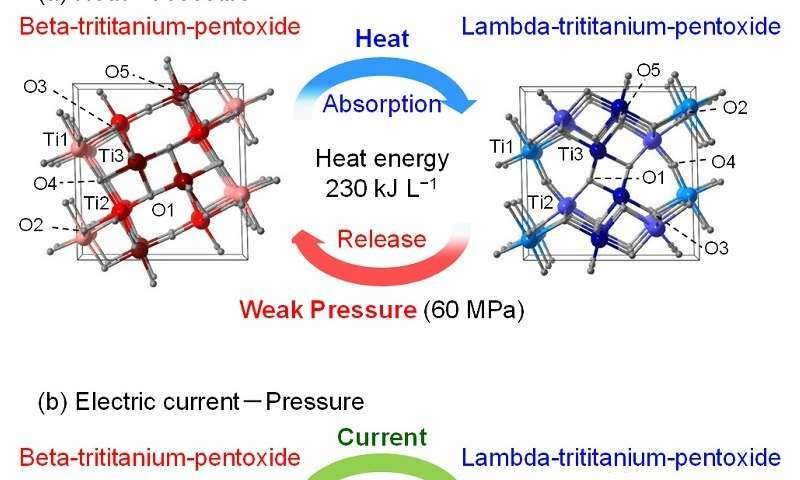 Additionally, applying a weak pressure of 60 MPa (mega Pascal) to stripe-type-lambda-trititanium-pentoxide induces a phase transition to beta-trititanium-pentoxide, releasing the stored heat energy. Besides direct application of heat, heat energy can be stored by passing an electric current through the material or irradiating it with light, enabling the repeated absorption and release of heat energy by a variety of methods. Stripe-type-lambda-trititanium-pentoxide is a simple titanium oxide composed of abundant elements and is environmentally friendly. The present heat-storage ceramic is expected to be a new candidate for use in solar heat power generation systems, which are actively promoted nowadays by European countries, and also for efficient use of industrial heat waste. This material also has possibilities for use for advanced electronic devices such as pressure-sensitive sheets, reusable heating pads, pressure-sensitive conductivity sensors, electric current driven type resistance random access memory (ReRAM), and optical memory.